← Scientists – more than socks and sandals! 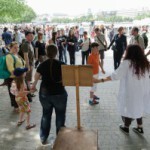 What does a Soapbox Science event look like? …and hundreds of interested members of the public! Our speakers are all women who are actively researching a huge range of topics within science, technology, engineering, maths and medicine. You can expect to hear about everything from how cells work to how stars are formed, and everything in between. Why just women? It won’t surprise you that science suffers as much from the gender-biased leaky career pipe as any other demanding career. Girls love science at school, and up to 60% of science undergraduates are women; yet only 15% of UK science professors are women. This means around 45% of the scientists trained and nurtured by the UK’s education system are being lost from the career ladder. 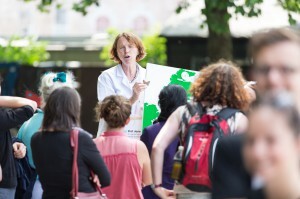 Soapbox Science is born from the hearts of active female scientists who are deeply concerned about the loss of excellence from the women of the UK’s science community. We always aim to have a wide variety of disciplines represented, with biologists, astrophysicists, medical researchers and climate scientists all on the line up, plus a whole lot more. We also aim to have a good spread of different career levels, so you could be hearing from a PhD student about their own research project, right up to a Pro Vice Chancellor who leads several research teams and a university! On the day, we set up 4 Soapboxes in a busy location like a riverside path, public park, town square or even the beach, and our engaging speakers and team of helpful volunteers draw in a crowd. 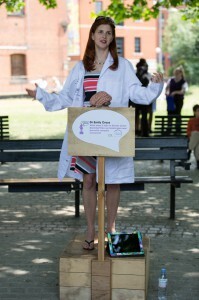 The great thing about Soapbox Science is that it gives members of the public, who might not otherwise have set out to hear about science, the chance to meet, chat and engage with researchers in person; our feedback tells us that they really enjoy the experience! Our events are also super simple and resource-light. Some wooden Soapboxes, branded lab coats for speakers and t-shirts for volunteers, and a few carefully chosen props. No microphones, no screens, no projectors, no posters – just our hand-picked speakers who are experts when it comes to sharing their passion for research. We’re also keen to make Soapbox Science the best event it can be, so we have a tailored program of evaluation to help us chart how we’re doing, what’s working well and what can be improved. This also helps us know how many people we’re reaching, and what impact Soapbox Science is having both on the audience, and on our speakers themselves. With nearly one hundred female researchers having taken part to date, and another 80 set to take to a Soapbox this summer, the program is growing fast. 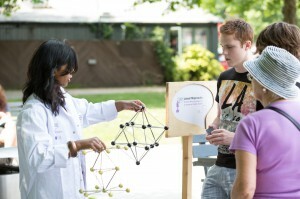 Our events attract hundreds of people, and have the potential to make a real difference to the visibility of women in science and engineering. 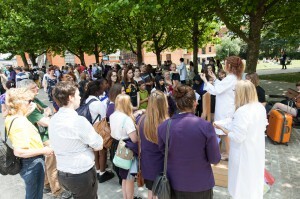 Soapbox Science London 2018 is looking for volunteers!